Washington senior Megan Downing gets ready for the return during a first singles match against Jackson in the Frontier Athletic Conference Tuesday, Aug. 14, 2018 at Gardner Park. 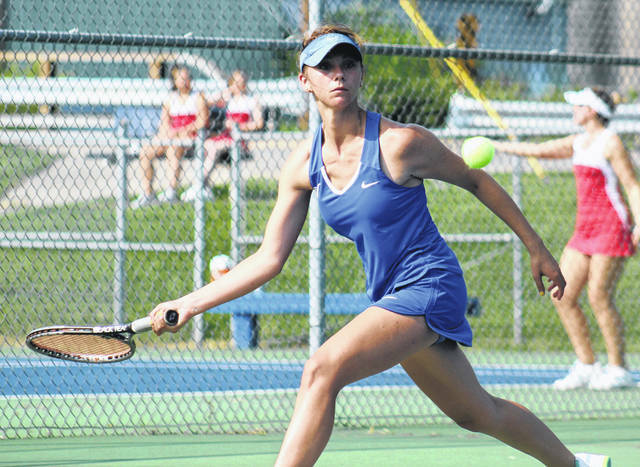 The Washington Lady Blue Lion tennis team hosted Jackson in a Frontier Athletic Conference match Tuesday, Aug. 14 at the courts at Gardner Park. At first singles, Megan Downing beat Sydney Humphrey, 6-3, 6-0. Washington’s Jen Richards fell to Mackenzie Humphrey at second singles, 1-6, 5-7. Brooklyn Foose beat Josie Ball at third singles, 6-1, 6-1. At first doubles, Beth Wilt and Sydnie Hall defeated Lillie House and Trinity Montgomery, 6-0, 6-0. At second doubles Brynne Frederick and Payton Maddux beat Caitlin Camp and Leslie Bragg, 6-4, 6-1. Washington (2-0 overall, 1-0 in the FAC) will host Circleville Thursday at 4 p.m.